Nashville is typically known for its country music and lifestyle, but with emerging talents like COIN, that’s becoming more of a false stereotype. Formed at Belmont University, the indie-pop quartet COIN has been writing, recording and performing since 2013. It consists of Chase Lawrence with lead vocals and synths, Ryan Winnen on drums, Joe Memmel playing guitar and singing backup and Zachary Dyke on bass. The band released its second album, “How Will You Know If You Never Try,” in April and announced American and European tour dates. The new album has received praise from internet music authorities like Soundfiction and Riff Magazine. COIN released one of those anthems, “Talk Too Much,” as a single before the second album’s debut, and it took off with more than a million YouTube views on the music video and 27 million listens on Spotify. It is arguably the band’s most successful hit, scooping up the eighth spot on the Alternative Songs chart and No. 28 on the Hot Rock Songs chart, the first time COIN has made it on either list. 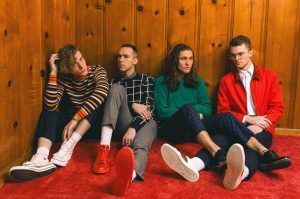 Luckily for Oxford, COIN will be performing at The Lyric Oxford just after making its appearance at the Austin City Limits Music Festival this weekend, and Ole Miss students are looking forward to it. Sophomore integrated marketing communications major Nancy Manroe said COIN has held on to its energetic style while growing more popular. Manroe, who has seen COIN live before in its hometown of Nashville, is excited to see the band in her own city of Oxford, especially to hear the newest album live. The Lyric will open the doors at 8 p.m. tonight, while the band should be hitting the stage at 9 p.m. Tickets are $15 to $30 on The Lyric’s website and will be available at the door.